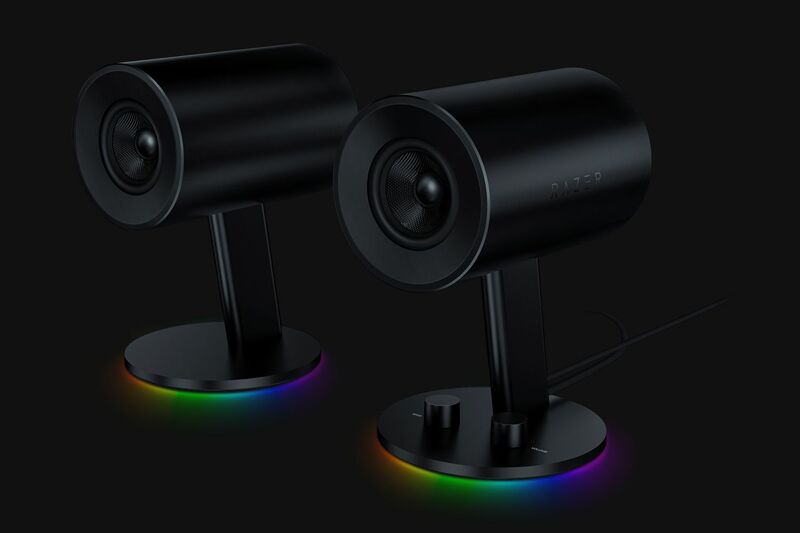 Looking at Razer’s design for their latest speakers – the Nommo Chroma – you’d be forgiven for thinking you were looking at some kind of high-tech IR-face-scanning, 3D web cameras. I can’t count how many comments I had from others in the office who thought I was somehow using them to stream from work. That’s not a negative either – these AU $249 speakers look sleek, minimalistic and pretty cool on your desk, whether you’re gaming or using them for music or general work. 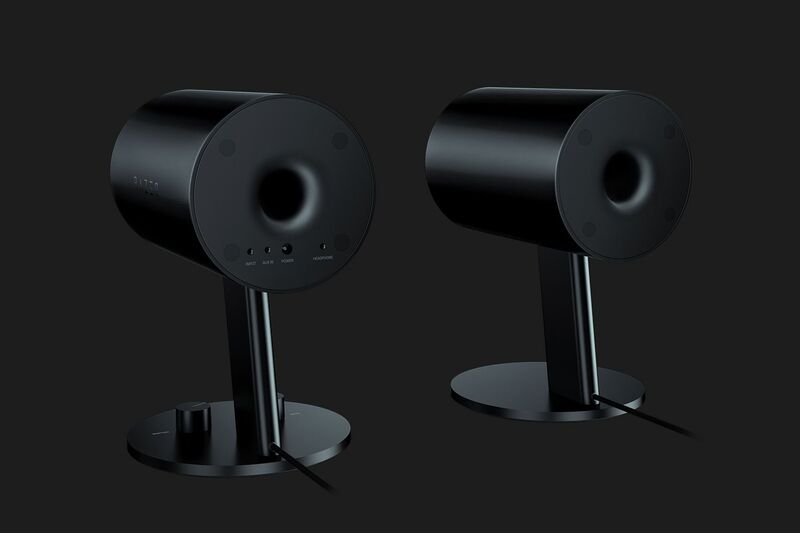 The Razer Nommo speakers come in two flavours – the Nommo and Nommo Chroma. 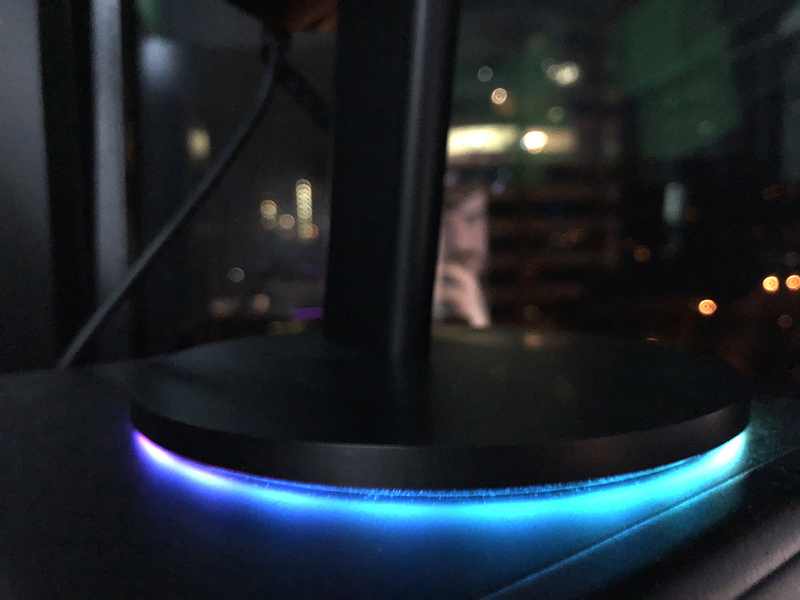 I had the chance to get my grubby, fingerprint-leaving mitts on the Nomma Chroma, which includes full RGB lighting on each speaker’s base and audio over USB, compared to the RGB-less and standard speaker connection on the cheaper AU $169 Razer Nommo. Both have the same 3″ drivers and rear-facing bass ports. It’s a significant price jump for what is essentially an aesthetic bonus in the additional lighting, but if you’re looking at these speakers anyway, chances are you’re after something that will make a statement anyway – that will look as good on your desk as it sounds. And it’s true – on a nice, clean computer desk, the Nommo Chroma’s unique design looks great, and is nicely accentuated by the ‘Chroma’ RGB lighting, which sits under the base’s rim. The best part about the, being a Razer product, is using Razer’s Synapse software to customise their look and animation. You can leave them on a certain colour, have them cycle through the spectrum or ‘breathe’ between various colours, even undulate in a ‘wave’-type pattern, or simulate the effect of things like fire. Even better, if you have other Razer Chroma products, like the mice or keyboards, you can use the advanced lighting customisation options in Synapse to sync everything together in a surprisingly robust fashion – layering effects on top of each other, or copying looks from one to the next. If you already have your gaming setup decked out with Razer Choma products, then the price bump up to a Razer Nommo Chroma might be justified. However, one caveat to consider is that the lighting on the Nommo Chroma seems dimmer – or if not, then less noticeable than in other Razer products. In normal room lighting, it’s only somewhat visible, acting more as a subtle highlight to the Nommo’s design than a centrepiece, and only starts to impress in lower lighting, or in a darkened room. In terms of audio quality, the Nommo Chroma performs pretty well in general use. The Synapse software offers four equalisers, for standard use, gaming, music and movies, and across all four sound is crisp and clear, and easy to distinguish between layers. Firing up Spotify, jazz and classical music tracks sound great, as the higher-end of the audio spectrum seems to be where these speakers like to perform the best. General voice quality when watching videos is good, although lower tones can get a little lost in the soundtrack, depending on the mix. For their strange shape and compressed size, the speaker quality is surprising, although it’s not without a couple of drawbacks. Despite a bass knob being present on the right speaker’s base, it’s difficult to tell how much it’s actually changing, due to the weak overall bass sound. As a result, rumbling tank fire in games, or heavy beats in dance music don’t have quite the thump some may want out of their speaker system. If you look behind the right speaker, you’ll find two 3.5mm ports, one for auxiliary input and one for headphone output. They’re not in the most convenient of places, resulting in some fumbling around the back if you need to connect your device semi-regularly, and unfortunately there is no input select on the speakers themselves, either. That means if you have a device connected via the aux port, and one via USB, both can be heard simultaneously on the speakers until you unplug one. The Razer Nommo Chroma is as much a stylistic statement as it is a speaker. Their unique shape and subtle RGB lighting may be just what you need to perfect the look of your gaming set-up, and Razer’s excellent Synapse software helps all of this as well, especially if you’re using other Razer products. At the price point, it’s also worth considering the Razer Leviathan, Razer’s virtual surround soundbar, which if you hunt around can be found for around $50 more, and comes with tweeters, a subwoofer and Bluetooth compatibility. If you like the Nommo’s look, but need even more power or bass response, a larger THX-certified 2.1 setup called the Razer Nommo Pro is on the way later this year, although the price jump is signifcant (and details can be found on Razer’s website). The Razer Nommo Chroma looks cool, has generally great performance for most uses, and it’s actually pretty fun to play around with its lighting controls. 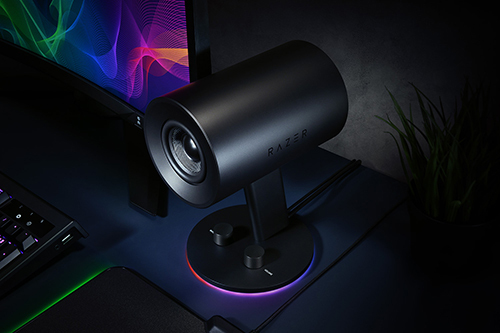 There are surely other speaker set-ups out there that will perform better audio-wise, or offer more features, but there’s none that look quite like the Razer Nommo Chroma. If you can see these USS-Enterprise-like speakers completing your gaming battlestation, and don’t need heavy bass or high-end features, the Nommo Chroma may just fit the bill.